This week's tutorial over on Splitcoast is a cute and practical Card Clutch - it's a folder made from a single sheet of 12" paper, and just a few simple folds put it together - no adhesive needed! The finished folder is about 4" x 8-1/2", and holds 4 smaller notecards and envelopes... these are 3-1/2" x 5" which is such a cute size to work with. I have some new clear sets to play with on my desk, so I used the one on top - these are a couple of stamps from my Beach Silhouettes set. I used Impression Obsession hybrid inks, and that tag die is from Sizzix. Big congrats! Your artwork is very well-deserving of these awards! 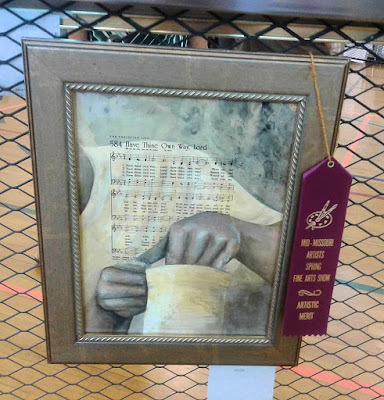 Dina, Congratulations on your win at the art show! I cannot believe you have never entered one before. Now that you have gotten your feet wet, I'm sure there will be many more awards to come. Good for you. Congratulations on your ribbons! I don't now why you were surprised! Congratulations on your art recognition!